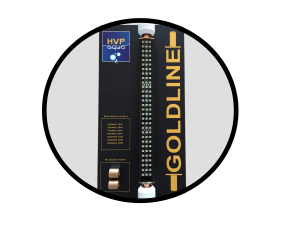 The Goldline Aquarium LED is a “one of a kind” and only available from HVP Aqua. We developed this lamp ourselves following the wishes of our clients. 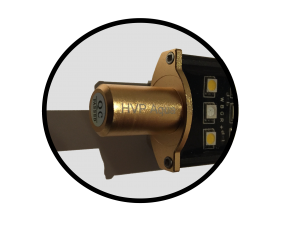 HVP Aqua greatly values the market’s requirements and proves it with this unique type of lamp. The Goldline really is an all-in-one, and features full plug & play capability. The lamp is composed of two white LEDs and RGB*. The lamp is fully IP68 water-proof and can be placed directly into a T5 or T8 armature. The Goldline Aquarium LED takes its name from its attractive “black and gold jacket”. Cable: 1x 2 metre power jack, 1x 2 metre RGB. Both can be fitted to the power adapter with an adapter cable (included). Available in 7 lengths: 438, 590, 742, 895, 1047, 1200 and 1450 mm. 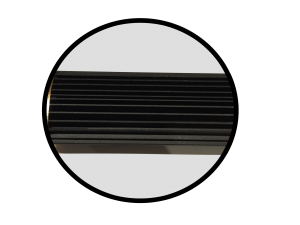 In order to provide heat sink, the back of the Goldline is equipped with special cooling ridges. As long as the lamp is given enough room to “breathe” (about 5-10 cm clear height), heat emission will barely if at all affect the lifespan of the lamp (30,000 to 50,000 burning hours). 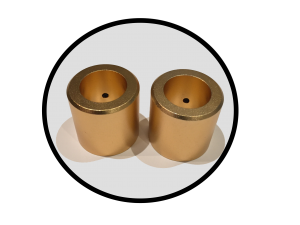 The lamps can be easily mounted in existing TL-holders (T5 and T8). For partnering dealerships, we have demonstration boards available. These let consumers experience the design and functionality of our Goldline Aquarium LED lamps. (*The RGB LED dimmer option is only available in combination with our controller. Without the controller, RGB, as well as the white LEDs, is always at 100%).